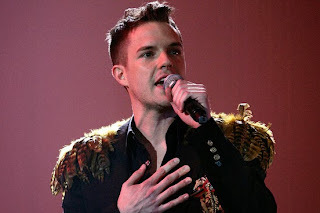 The Killers' frontman Brandon Flowers has revealed that he plans to spend 2014 writing and recording a new solo album. Flowers released his first solo album, 'Flamingo', in 2010. Speaking to NME in a new interview in this week's issue, available digitally and on newsstands now, Flowers says he will be taking steps toward a 2015 release of the album when he finishes touring with the band. "I'm excited about going home. I'm looking forward to having a normal year. But I'm going to write. I'm going to be filing those diamonds, It's my job," says Flowers. He adds: "I'm just going to put my heart and soul into my solo record." Having been on tour promoting their 'Battle Born' album for 15 months the band recently played their first shows in China. The Las Vegas band had been scheduled to play in the country in 2010, but cancelled due to the death of singer Brandon Flowers' mother. In June of this year the band played a headline gig at Wembley Stadium in London. The Killers recently announced plans to release their first Best Of – titled 'Direct Hits' – on November 11. The 15-song compilation will feature two brand new songs – 'Just Another Girl', which sees the band reunite with longtime collaborator Stuart Price, and 'Shot At The Night', which will be released as a single on November 4, and is produced by M83's Anthony Gonzalez. Deluxe versions of the album will include a demo version of 'Mr Brightside' and a Calvin Harris remix of 'When You Were Young'.